Glowing softly from the inside, with maroon wall coverings and exquisite coloured-glass light fittings, Istanbul is clearly a place to relax. 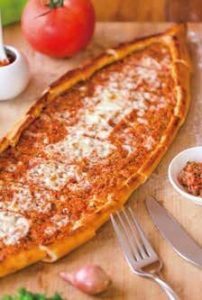 The owner and head chef are both themselves Turkish and Istanbul is the only restaurant in Qingdao to provide authentic Ottoman and Mediterranean cuisine. Going up from the bar-like area downstairs, the cosier, more intimate restaurant area is spacious and comfortable, with soft chairs and large mirrors. The real pleasure in coming to Istanbul, though, is of course their food. 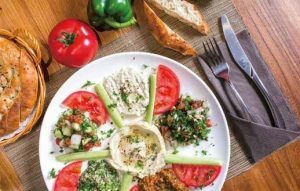 Their thick, creamy yoghurt is made in house, and a pot of it accompanied our mixed starter plate, which itself was a beautifully presented mosaic of dips and tasters, with Istanbul’s best-seller, a rich hummus, at the centre. All meat at Istanbul is halal, and the careful attention to meat quality is obvious in its taste. The lamb in particular is tender and rich in flavour, and in the Sultan’s Delight dish, blends perfectly with the surrounding aubergine dip. 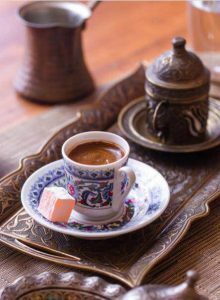 Meals should be finished off here with a taste of real Turkish coffee, which is a completely different flavor to the more commonly used Arabica style (used in Starbucks and most restaurants). We at REDSTAR had never tasted anything like it before, and it’s earthy, chocolate-like and almost spicy taste went beautifully with the sweet, creamy dessert that we thought we had no room for, until we tried it.